A network of East Bay women provides immigrant residents with legal help and psychological support. Etel Calles, a volunteer with the Immigrant Family Defense Fund, said she’s motivated to help families facing deportation because of her own immigration experience. As a child, she came to the U.S. alone in order to flee the civil war in El Salvador. On a May morning in 2016, María was in the kitchen of her Oakland home preparing molletes — bread with butter, beans, and cheese — when her husband left for his construction job. Moments later, her 11-year-old daughter screamed: An Immigration and Customs Enforcement officer was handcuffing María's husband outside of his car. María and her daughter rushed outside, where several immigration officers and their cars were blocking their access to the street. "I didn't know what to do in that moment," recalled María, who only wanted to use her first name because both she and her husband are undocumented. Distraught, María went to Melrose Leadership Academy to explain why her daughter wouldn't be at school that day. Located in Oakland's Maxwell Park neighborhood, the dual immersion school has a student population that's 50 percent Hispanic, and for their families, deportation is a constant threat. Inside the school's entrance are posters with tips for dealing with ICE agents. One states: "You have rights, don't let ICE or police enter your house." An envelope contains red cards that say in Spanish: "Do not open if an immigration agent is knocking on your door." 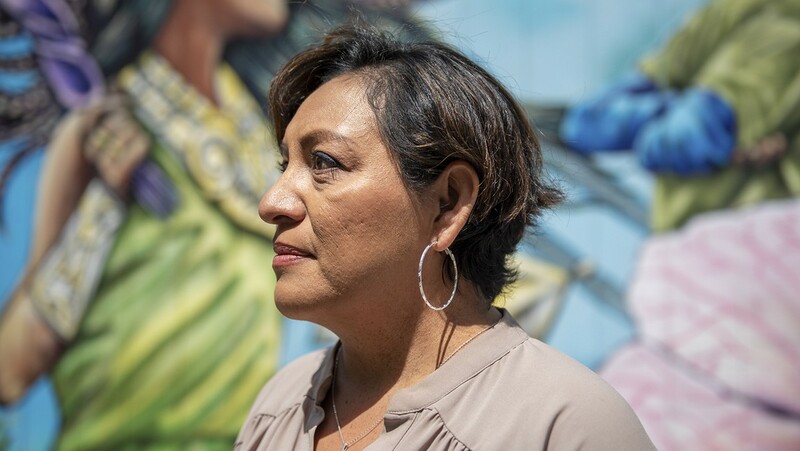 Moyra Contreras, the school's director, immediately put María in contact with another mother, Etel Calles, a volunteer with the Immigrant Family Defense Fund. The nonprofit helps those who are facing deportation with legal help and assistance paying immigration bonds. A few hours later, Calles and a lawyer from the defense fund were sitting in the U.S. Citizenship and Immigration Services office in San Francisco, waiting to pay María's husband's $2,000 bond. María wouldn't have been able to pay the bond herself, since the signer of the bond needs to be a U.S. citizen or permanent resident. By paying the bond (which María later reimbursed), the defense fund allowed María's husband to be back home by that evening — rather than on a flight to Mexico. It's just one way that local activists are trying to help immigrant residents who are facing deportation. Despite Oakland and California's "sanctuary" laws, deportation is still a threat for local immigrant communities. According to ICE statistics, the agency's San Francisco office — which covers all of Northern California, as well as Hawaii, Guam, and Saipan — deported 6,292 people in fiscal year 2017. A network of local women activists assist with not only legal aid but also to help people cope with the constant anxiety and fear of deportation threats. Some of these women activists offer to take children to school, or help write a "family preparedness plan" to arrange for others to take care of children in case parents are deported. Others lead "know your rights" workshops or provide emotional support. Some use activism or religious faith to help families cope with the uncertainty of not knowing if a loved one could suddenly be forced to leave the country. For Calles, the desire to help families deal with deportation was motivated by her own immigration experience. As a 10-year-old, Calles was sent alone by bus to the U.S. to escape the civil war in El Salvador. She remembers saying goodbye to her father, who she never saw again. Over five days, she crossed through El Salvador, Guatemala, and Mexico, until she reached Los Angeles. To relieve her fear on the trip, her family gave her a letter telling her about all the beautiful things she would see on her way. "But they didn't talk about the bad things" — the noises in the dark or the strangers that would surround her, Calles recalled. Today, Calles is in her forties and has an easy laugh and a strong hug. In addition to being a volunteer with the defense fund, she is co-president of the Parent Teachers Student Association at Melrose Leadership Academy. When her son enrolled in the school, Calles thought she could help students cope with immigration-related anxieties. She shares with them her childhood experiences in El Salvador and her journey to the U.S. as an unaccompanied minor. She talks about the uncertainty she felt growing up when hearing a helicopter because she didn't know if it was bringing water or snipers. "I talk about my anxiety and fears — that hasn't changed," she said. "I tell them that no one knows the traumas and fears of others, but we can all be kind and help and just be a good friend so [the newcomer] doesn't feel lost."